The Northern Territory (NT) Government’s vision is through the provision of purpose-built homes in a safe community environment, senior Territorians who actively live independently in their own home will remain in the Territory and be able to transition into appropriate accommodation by ‘downsizing’ and ‘rightsizing’ if they wish. The NT Government is also interested to ensure that the operating structure for delivery of residences maximises consumer protections. 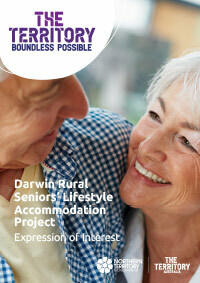 A study by KPMG on behalf of the government found that there is demand for seniors’ accommodation in the Darwin rural area. By supporting private sector development of residential seniors’ accommodation, government is allowing market forces to determine the most appropriate model for the accommodation and the location in which it should be developed. In September 2018, expressions of interest (EOI) were sought to develop and operate a seniors’ lifestyle purpose built accommodation village, in the Darwin rural area. The EOI period closed in December 2018 and four expressions of interest were received from both local and national proponents. The next step is the request for detailed proposals phase. This stage of the competitive process will provide more detail about the proposals that will put the government in a better position to assess the project’s risks, opportunities and the potential outcomes for Territorians. The NT Government put forward a Crown land site option as part of the EOI process and this is the only site option being considered as part of the request for detailed proposals phase. The potential site includes proximity to services and transport in Coolalinga, approximately 29km south east of the Darwin Central Business District and 10km south east from Palmerston. The area is part of a growing commercial precinct with major national retailers and speciality shops; and seven recreation nature reserves each offering its own range of activities. A range of options for how the site could be configured and utilised as part of its development were put forward in the EOI and these will be further assessed and refined through the request for detailed proposals phase. Potential delivery models will also be further assessed as part of this request for detailed proposals phase. This phase will also allow the Territory to further analyse and consider project delivery models to see if there is a scenario that achieves the necessary balance between risk and opportunity. This next stage of assessment will continue to focus on the delivery of seniors’ lifestyle accommodation, which is distinct from and different to aged care.